Laurence Schor, Allison Geewax and Dennis Ehlers attended the April 14th reception hosted by The Construction Alliance at the R.I.S.E. Demonstration Center to welcome Mayor Muriel Bowser and her economic development team into the small and minority business community of DC. The ‘Built in DC by DC’ event highlighted the importance of increased participation of local minority, immigrant, and Hispanic-owned enterprises in public and private development projects across the region. The purpose of the #BuiltinDCbyDC movement is to create opportunities for community businesses and generate exposure to developers, large general contractors, public partners, and other firms in the construction and contracting industry to create a cohesive network. 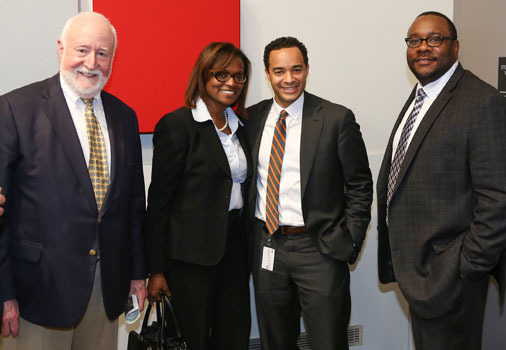 Larry Schor with the DGS Chief of Staff Ms. Owens, Deputy Mayor for Economic Development, Brian Kenner and Brad Lewis from Hensel Phelps.